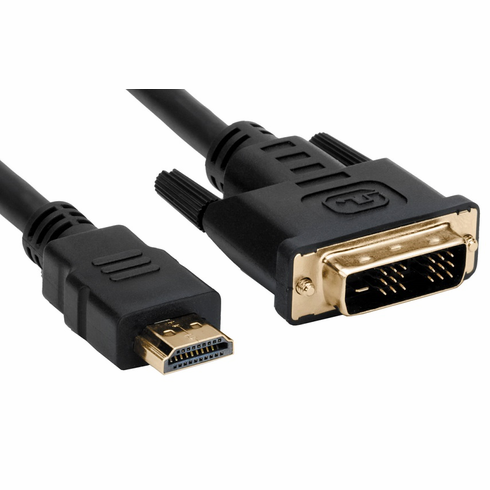 HDMI to DVI cables are the best way to connect HDMI devices to DVI equipment and vice versa while maintaining a high quality signal. The most common application for this cable is to connect a computer to a high definition display. HDMI to DVI cables provide equal quality high-definition resolutions as regular HDMI to HDMI cables. These cables are capable of resolutions up to 1080P. Purchase was easy, delivery prompt and product as advertised and works. Can't beat their prices and great products. The cable I got from you greatly improved the quality of picure from our DVD player. I have had no problems with it. The only thing I can't figure out is how you can sell it so cheaply when the big stores charge $50.00+. I will use you again for any cabling needs. I have bought from PCH 3 times twice for my company all involved in the decision were gratefull for the savings and cables that worked without fail. TV, computer it does not matter they work. Saving 350% on my last purchase I will be back again. I used the cables to connect a computer to a home theater. They work great. Great product at afordable price. Connected my multimedia PC to 58"" HDTV, superb quality. Had an older GeForce (6600) card wih DVI output. The cable added no distortions. Well, what can I say? I ordered this cable, picked it up, plugged it in and it worked! No problems, no fuss. You could spend more for cables but with the fast shipping offered here and these quality products it would be foolish to do so. Buy this cable to connect your new HDMI LCD monitor ie. Hanns HG216D like I did and enjoy perfect performance from your GeForce video.